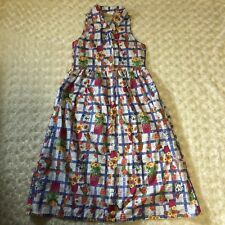 Laura Ashley Mother & Child Checked Floral Flower Pot Cotton Dress 9 Years 53"
Laura Ashley Mother & Child Sleeveless, Button Down Dress for a 9 Year Old. Color: Blueish Purple and White checked with multi-colored flowers/flowerpots. Dress is fully lined, with a crinoline between the outer skirt and the lining to give the dress fullness. There are crocheted carriers for a sash at the waistline, but no sash. The sash could be replaced by a yard-and-a-half of wide satin or grosgrain ribbon, either in white or a contrasting color, and it would look like it belonged. NWT Laura Ashley Floral Ruffle Dress Size 6X Gorgeous dress! White with pink, turquoise, orange, and green floral print. Ivory lace ruffle at bottom. This dress is so precious. Ruffle flutter sleeve. Check out my other listings! From a smoke free/pet free hone. Feel free to ask any questions! Sorry, but no returns. Thank you! Adorable new spaghetti strap sundress in 100% cotton. Top lined in white cotton. 100% cotton. Ruffle collar and hemline. Pink and blue floral print. Light blue ribbon belt. Cute Laura Ashley girls size 6 dress with a tiny floral pattern. Super cute smocked front. This dress also has a very handy loop in the back for proper placement of the ties. Laura Ashley sleeveless floral dress - girls size 6X. - 100% cotton. Length down back - 26". Double ruffle gingham. Small green fabric flaw on back of dress skirt. See photos. Color: white, yellow. Machine wash. Freshly laundered. Ruffle collar and ruffle tiered hemline. Pink and purple floral print dress. Button back closure. White background with tiny green floral print, fit & flare with back tie. Scalloped peter pan collar, pleating on chest and near skirt hem. 100% cotton. length: 21". Size: 6X. Lace dress with a floral pattern. White sash tie-back. Button back closure. Top of strap to hem is 26, underarm to underarm is 11 1/2. Pretty Laura Ashley cotton sleeveless sundress, 6, back buttons, floral print on white, sash, collar, lined on top only. Shoulder to hem is 29 1/2, underarm to underarm is 12 1/4. Sweet casual wear dress for the season, nice condition. For auction is a previously worn, but in excellent condition, girls’ Laura Ashley smocked orange, blue, yellow, and green madras plaid sleeveless sundress. There is no size tag, so please refer to the measurements below. I am guessing, based on the measurements, that it is a girls’ 4-5. Measurements Shoulder to shoulder 10” Underarm to underarm without stretching 11.5” Waist across laying flat without stretching 13” Hips across laying flat 17.5” Shoulder to hem 33.5” Waist to hem 22” Please see my other auctions as I am happy to combine shipping. Buy 4 or more listings and get free shipping. Please request a combined shipping invoice before paying. I cannot offer free shipping internationally. Thanks for looking! Laura Ashley London dress size 6x. Waist is 13 in. and length is 26 in. Across the bottom of skirt is 33 in. 5 ruffled edges around hem and ruffled neckline also . Can can slip underneath . Textured fabric . White satin ribbon for belt and bow,not original . Really pretty little dress I believe is vintage. Thanks for looking . 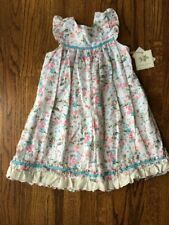 NWOT LAURA ASHLEY blue with white embroidered flowers Girls dress, SZ 6x. CLEAN AND EXCELLENT USED CONDIITION, with no flaws or stains. I would never intentionally misrepresent an item but since I am only human, things can get overlooked. Vtg LAURA ASHLEY Dress Floral Blue & White SIZE 4T Eyelet LOVELY! Such a pretty dress. Ruffled underskirt and crinoline. No stains holes or tears. Features 100% cotton, super soft thin wale corduroy in an allover orange, white and green floral pattern. 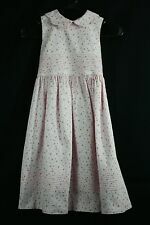 Classic LAURA ASHLEY girls size 6X- pale pink floral sleeveless dress. Sleeveless design with beautiful scalloped collar, pleated waist and skirt, button back closure with tie. Dress is pink and white and is lined. THE SEMI-FITTED BODICE FEATURES FLORAL EMBROIDERY AND PIN TUCKS, EDGED IN FRILLS DOWN TO THE STRAIGHT WAIST LINE. THE DRESS FASTENS AT BACK WITH FIVE MOTHER-OF-PEARL BUTTONS. SIZE LABEL : 11 YEARS. LENGTH: 40 " or 101 1/4 cm. Green corduroy jumper dress with floral print. Girls size 6 years. One front pocket; buttons in back. Length 31". Laura Ashley Floral Print LINED Girls Size 5 Dress. EUC. PERFECT FOR EASTER. EXCELLENT CONDITION. It is a little girls size 5 This dress is done in red, yellow, purple and white checks. There are embroidered flowers around the hem and one lone flower on the bodice. It buttons in the back. 100% cotton and machine washable. Eyelet embroidered detailing with scalloped hem line. gorgeous deep pink or maybe red with white stripe. Not responsible for fit. Laura Ashley Girls 3 T Dress Toddler White and Pink with Flowers Sleeveless. Light Pink with Different Shades of Pink Flowers. Eyelid Pink Lace Trim on Bottom. Machine Wash. Pullover with one button closure. FOLKLORE COUNTRY STYLE MAXI DRESS: 7 YEARS. A TRULY STUNNING, EYE-CATCHING DRESS IN SOFT, DURABLE GINGHAM COTTON WITH A TWO-CHECK PATTERN IN CRUSHED STRAWBERRY/WHITE COLOURWAY. FLORAL ADORNED PATCH-POCKETS ADD DETAIL. Laura Ashley London Crinkle Dress. Yellow crinkle material printed with flowers. Shell: 80% Cotton, 20% Nylon; Lining: 100% Polyester. Care instructions: Hand wash, line dry. Dress is in beautiful condition. SUNDRESS : 5-6 YEARS. SIZE LABEL : 5-6 YEARS. Elastic bust, ties around neck, knee length. The original bow has been sewn back on the dress. It is missing from the pictures. It is a high waisted dress with small pleats in both the front and back of dress. It closes, with buttons, and ties in the back of dress.